This is a story of my family’s history in creating Sioux City’s first fast food drive thru restaurant. 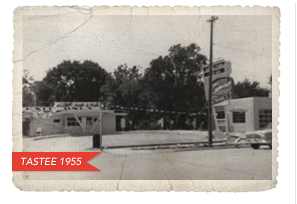 In July 1955 Tastee Inn & Out was born and it was located at 2610 Gordon Drive in the neighborhood, called Greenville. It was built long before any national fast food chains thought about moving to Sioux City. My parents, Vincent and Marie Calligan were the entrepreneurs that built the Tastee Inn & Out in Sioux City and it was not their first business endeavor as a couple. However, they dived into the Tastee with all the zest and zeal any 2 people could muster. Vincent (Vince) was born in West Bend, Iowa and was 3rd generation Irish. Marie (Osipowicz) Calligan was 1st generation Polish and Sioux City was her hometown. Marie love to cook and as a youngster, she worked in lodges moving food between tables and kitchens in order to learn everything she could about preparing food. My parents met initially in Sioux City at a local nightclub, where Marie worked and Vince was a customer. They later married in 1940 and ran a tavern (bar) in Greenville and operated this business for over a decade before they decided it would be better to run another type of business. Marie was tired of cleaning up messes, which was par for the course for bar business and tired of seeing Vince having to execute his skills as a bouncer, even though this duty was a natural skill for a large Irish man. After opening the original Tastee on Gordon Drive, they open a second Tastee located in the west part of Sioux City at 1902 Court Street in 1957. Throughout the 1950’s I seldom saw my parents at home. So in order to get to know them, at the age of seven, I started to work at the Tastee. The restaurant became my classroom for math, human resources, marketing, and equipment maintenance and product procurement. With this early education, I am still operating the Tastee today. Tastee’s success is dependent on the continued insistence on using quality ingredients in making of Tastee’s unique food. Every day, hundreds of pounds of quality fresh (not frozen) ground beef are purchased and cooked with a special Tastee sauce blended to make the famous Tastee sandwich. Every day, fresh onions, by 50 pound bags, are pedaled, blanched and breaded to make the fresh scrumptious onion chips. Seasonings are mixed precisely and whipped to make the yummy creamy onion chip dip. And even though the kitchen is busy preparing these iconic items daily for our customers, another special meat sauce is cooked from scratch for our Tastee pups (hot dogs). And next to this sauce on the stove, a chili recipe is prepared as a tantalizing American soup, rather than the normal thick and pasty chili other competitors make. Historically both my parents required nothing less than perfection when it came to preparing these recipes which are behind making the iconic Tastee food. Cheap ingredient substitutions are never allowed into making these recipes. To this day Tastee Inn & Out has never become a warming house for frozen food, which is the case for most national fast food chains today. Vince passed away early in 1972 and since that time my mother and I have operated the business, until all restaurants were sold except for the original Tastee Inn & Out located on Gordon Drive. The Tastee on Gordon Drive is still operating due to my continued faithful customers and to the caring work provided by amazing employees. I want to thank all my customers and employees for Tastee’s success. It is a privilege to be part of my customers’ and employees’ memories with their patronage and hard work at the Tastee. The Tastee is tied to many wonderful memories with my family. It would take a book of encyclopedic size to tell all the stories that have occurred inside and outside the walls of the Tastee, while it became the iconic food establishment it is for Sioux City. Besides the food, much love and effort goes into maintaining the original Tastee Inn & out neon sign located at the corner of the property. People from all over the country, which have moved away from Sioux City and return for a visit, also come to take their picture next to the neon sign and next to the Tastee where it all started.